Amal Clooney doesn’t have a monopoly on style in her family. The internet is freaking out over pictures that have surfaced of Amal’s sister, Tala Alamuddin. It takes a lot to steal the spotlight from Amal, but if anyone can do it, it’s Tala. And if there’s anyone in the world who has better hair than Amal, it’s Tala. Paparazzi caught the stylish siblings recently when both of them had dinner with George Clooney and the Alamuddin sisters’ parents, Baria and Ramzi Alamuddin. While Amal has gotten all the credit for becoming a style icon since she started dating George Clooney, fashion sense seems to be a family affair for these two — Tala stunned in a fitted white dress with a matching vest, knee-high snakeskin stiletto boots and a matching oversized handbag. The chic getup was a little more refined than the edgy looks she’s been photographed wearing, and with her waist-length hair down and simple makeup similar to her sister’s, we’re willing to bet Tala was turning heads all night. Tala was first photographed spending time with Amal in Italy ahead of the Clooneys’ wedding last September. Even then, fans took notice of her style — a formfitting royal blue dress. According to E! News, Tala lives in Singapore, while Amal and George are living in New York while George films his latest movie, Money Monster. 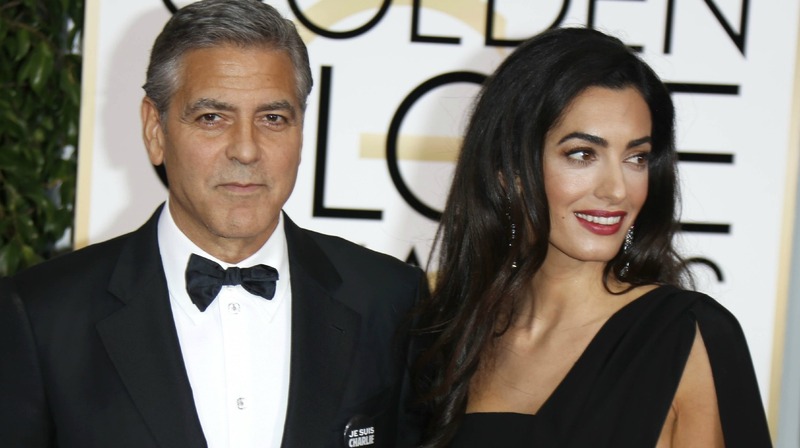 Amal, a famous barrister from London, is reportedly working as a visiting professor at Columbia Law School while she lives with her husband in the United States. Meanwhile, anyone who formerly obsessed over Kate Middleton’s gorgeous sister, Pippa, now has a new style icon. What do you think of Amal Clooney’s sister? Are her looks as red-carpet-worthy as her sister’s? Head down to the comments and let us know.